Some files are quite large but need little adaptation. The statutes in parts 05.07 and 05.08 need to be adapted where necessary in accordance with the laws of the host country. Files 05.11 and 05.17 refer to the environmental effects of the project. The statutory requirements of the host country need to be analysed. Copies of laws and regulations should be cited and, if possible, attached to the project documentation. The project is local. With the exception of small gypsum quarries for material for local use only, the project does not exploit natural resources. It protects them. Description of the structures and a description of improvements to the quality of life of the inhabitants. The texts need to be adapted as required. 05.00 THE ORDER OF SEQUENCE FOR PROJECT ACTIVITIES. 05.07 Statutes for the Local Cooperative (name) for the on-going management of the structures created. 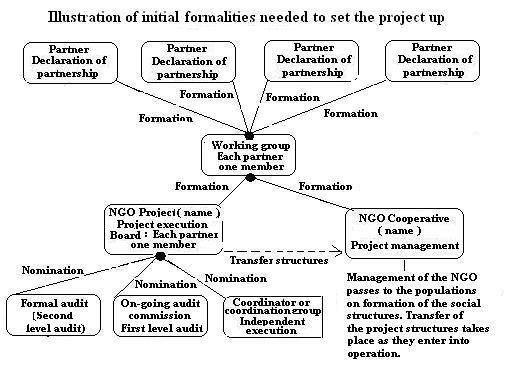 05.08 Statutes of the NGO (name) responsible for execution of the project structures. 05.32 Units for the production of mini-briquettes for high-efficiency stoves. 05.44 Lighting for study purposes ; lighting and photovoltaic refrigeration in clinics.